Background information: What is the AOAC? Why is it important to have either of these validations/certifications? Lisa has a total of a combined 15 PTM’s and OMA’s, two NF VALIDATIONS following the industry standard of ISO 16140-2, and is on the Board of Directors for the Food Allergy Research and Resource Program (FARRP). She supports 3M Food Safety across our microbiology and chemical platforms. What is the difference between AOAC® INTERNATIONAL PTM and AOAC® INTERNATIONAL OMA? Major differences lie in the process of approvals for these methods, though they start the same. Both begin with an application to the AOAC Research Institute. Following this, both will undergo an independent lab evaluation for the purposes of verifying performance claims and method applicability. From here, different processes are taken. Those applying for a PTM Certificate will then go through a peer review of data, compiling both the original method and independent laboratory study into a manuscript and submit to AOAC RI for review. If no issues are found the AOAC Performance TestedSM Certification will be granted, and will need to be review and renewed each year. For companies and laboratories that wish to complete the Official Methods of AnalysisSM (OMA) program, an additional step is needed. Along with more rigorous reviews within an Expert Review Panel (ERP) Meeting, those wishing to qualify must also undergo a multi-laboratory, or collaborative, study. Why would a lab choose to undergo the extra step of a collaborative study? How can I tell the difference between these 2 methods of analysis? It’s not always easy to quickly distinguish the type of AOAC method a product carries if you don’t know what you’re looking for. Fortunately, we have two ways for you to easily find out. Check online at for PTM certifications. For OMA certifications, you have to be a member to see this information. 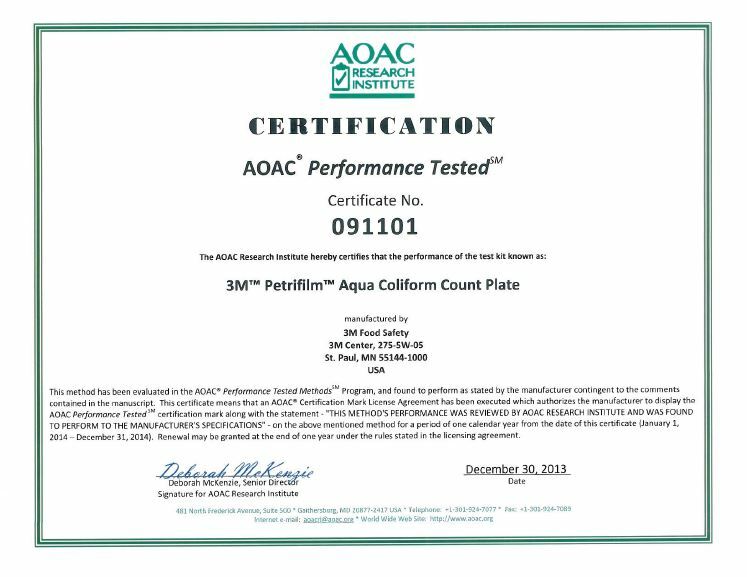 Note the wording: if something says AOAC® R.I. Certified, that means it’s undergone a Performance Tested Method (PTM). If it says AOAC® INTERNATIONAL Validated – this means it either has Official Methods of Analysis (OMA), or both OMA & PTM. A white paper on the importance of laboratory recognition and third party validated methods in food microbiology laboratories was recently published. The white paper can benefit those interesting in additional information on the various methods used for validations and verifications. What role does 3M play into this? More recently, the 3M™ Petrifilm™ Rapid Yeast and Mold Count Plate earned its Official Methods of Analysis (OMA). This product features a new indicator technology that makes colonies easier to interpret. This sample-ready-culture-medium system provides results in as little as 48 hours of incubation time. 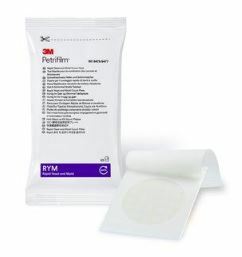 Information on all Validations and Certifications for the 3M™ Petrifilm™ Plates can be found here. Depending on your [food manufacturer/facility] product and facility the alternative method should be fit for purpose. The jurisdiction that your products are being audited (FDA or USDA) may possibly have an impact for choosing the appropriate alternative method. There are differences in each AOAC program, familiarizing yourself with both may be beneficial. The FDA does not recognize the Performance Tested Method (PTM) as an alternative method to OMA because there is no collaborative study completed as part of the PTM. All methods tested under the OMA framework undergo “rigorous scientific and systematic scrutiny” to ensure that the results are credible and defensible. Lisa added: “Global experts in regulatory, research, reference labs, as well as end users all got together and created the study design schematics. You’ve got the voice of industry when you’re validating your method through the AOAC Appendix J study design.” OMA certifications also don’t expire (unless your methods or materials do). They’re truly a lifetime achievement. Additional information can be found on our validations and certifications for Pathogen Detection Solutions and 3M Petrifilm Plates. 3M Food Safety has also completed two PTMs for our Allergen Tests, and has additional product validations, certifications, and recognitions in Australia, Brazil, Canada, Chile, Columbia, El Salvador, Japan, Korea, Mexico, New Zealand, the Republic of South Africa, Venezuela, and Vietnam. Need more information on the total 3M Food Safety testing solution? Simply reach out and we’ll be happy to help you with any questions you have. Contact a 3M Food Safety expert.